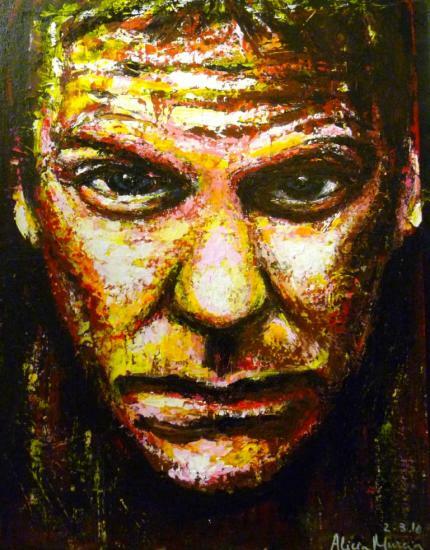 This painting was done with palette knife, it is my first portrait done with this technique! i hope you like the result! thanks so much dear rosemarry!!! thanks! i really appreciate! i love your gallery by the way! i m so happy you like it!! it was tricky to do, but lots of fun! spring is not coming yet!!! it was warmer in New York!! oh well, with the bad weather i have a perfect excuse to stay at home and paint! oh dear! there is sunshine now!!!! i hope it stays!! have a fantastic weekend there in Japan, my dear friend!! thanks so much!! i like a lot your gallery, great work!! it is superb to be able to combine art with your studies! keep up excellent work!! Thanks for the encouragement!!! You keep up the excellent work as well!!!!!! thanks! that´s one of the reasons why i love this site, the fact of artists encouraging each other!! That's so true! You'll never read anything discouraging here!! yes! the outside world is hard enough! it is so nice to have a kind of art sheltter/cave here! Don't even mention it!! It's a godsent!!! indeed! hav a great evening! thanks so much again dear umberto!! es normal, yo mismo no sé cómo acuarela. pues por un primero te sale muy bien!! excellent work my dear Alicia!!!!! thanks so much!! it was quite challenging! i m so happy you like the result! thanks so much! i really appreciate your opinion!! thanks a lot!!! i also loved your gallery, it is great, well done!!! i really mean it! have a great weekend!!! Wow Alicia, i feel like i want to touch his face! It looks so rugged and real!!! love the technique!! thanks!! that is my famous painting knife! i really like it a LOT!!!! the colors, the expression... i can see your love went into it at full blast! its awsome! i m so happy i managed to transmit that!! yes, i did put a lot of love and passion into it! i just had an idea last night! i m going to do business cards as an artist! maybe i´ll say something like "painter of characters of the performing arts"! like that i´d include Flamenco stuff and portraits!!! a bit crazy, isn´t it? NOT AT ALL!!!! ITS BRILLIANT!!! Saw a movie of him last friday (older one on TV) and all i saw was Alicia and this Painting of him you did! superb!! which movie was it? sorry i´ve been away,i m soo busy at work at the moment..and in the evenings i m preparing my painting exhibition! i´ll set it up on Monday and do a reception next Friday! how r u doing=?????? i´ve missed u! Oh dear i have thrown that mag away already with the Kiefer movie.. but he is going on holiday and Sandra Bullock plays his girlfriend, she gets kidnapped by Jeff Bridges, who plays a weirdo professor... Kiefer keeps looking for her... then meets a waitress (who played opposite Tome Cruise in Cocktail) and they nearly get murdered by Jeff Bridges.... ring a bell?.... Oh i am well... having my hands full too, but not as much as you do! WOW!! So glad your exhibition is keeping you on your toes... by the sound of it you could soon give up your job and become a fulltime artist! looking forward to see that horse!! i did paint a horse too last month, i´ll post it soon. How are the house renovations going? lots of kisses!! i m sure u r doing a great progress! going to participate in my first Art Fair on Sunday! wish me luck! have u done that before? trying... am supposed to paint my cuboard in my studio today... but i have a bit of a headache and that is not a good combo with paint! maybe i feel a bit better later this afternoon No i have not been involved with an Art Fair, although here is one, a small one on sundays too, but i just don't have enough paintings or sketches to take there... BUT GOOD LUCK to you!!! I am sure, you will find many fans!!!! You ROCK!!! You make me so proud, you go out there and do it, a real Go-getter!!!! thanks so much dear Lanka!!!! i love your work, specially the last portrait!! i really like ball pen drawings!! you`re welcome, dear Alicia! and thanks much again for your very kind words, my friend! i really mean them!! keep up great work! thanks! and amazing gallery by the way, superb technique!! have a great weekend!! thanks, i do appreciate a lot!! **HAPPY HAPPY BIRTHDAY!!! ** mi amigaaaa Wishing you a joyfull day with lots and lots of presents! love you precious!